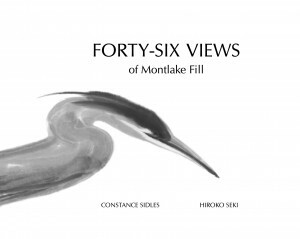 “The grace and charm of Hiroko Seki’s illustrations bring to mind the precise vision and the brush strokes of the Japanese masters; Constance Sidles’s verses remind us that ‘the poet’s pen/Turns them to shapes, and gives to airy nothing/A local habitation and a name’ (Midsummer Night’s Dream). Shipping free within the United States. International shipping rates apply. Shipping now! 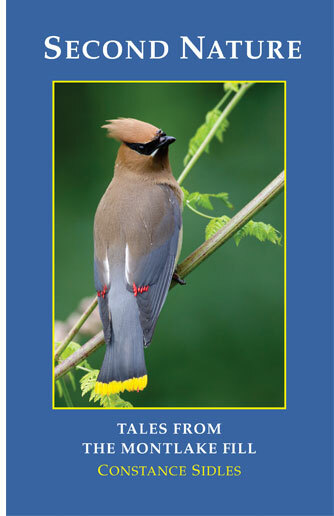 This is not a book about birds, however. It’s a guide that describes how to find joy in ordinary life. By studying the interactions of the wild creatures who share our planet, Connie distills the essence of what it means to be human — and happy. Shipping free within the United States. International shipping rates apply. 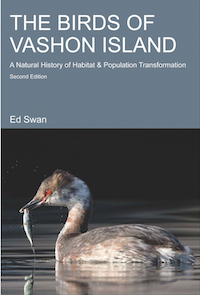 Vashon is a rural island of great bird habitat set in a sea of urban development. Its wind-swept beaches, thick stands of second-growth conifer and madrone forest, open farmland, and thickets are home to more than 250 different species of birds. Naturalist and author Ed Swan helps readers know more about the Island’s bird species and how and where to find them. He illuminates the connectedness of the birds to the condition of the land and water on which we all depend. The Birds of Vashon Island is available at The Swan Company and at Seattle Audubon’s Nature Shop. In the rush of modern life, in the chaos of a world that is often in crisis, where can you find peace of mind? Constance Sidles finds it in nature. If, like her, you’re searching for a haven that gives you respite from cares and hope for the future, then come with her as she takes you on a journey into the wilds of a natural area set in the heart of a city. The Montlake Fill is 75 acres of wild beauty on the University of Washington campus in northeast Seattle. 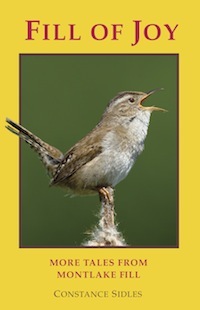 In 32 essays arranged into the four seasons, Connie describes the birds who come here and the things they do. In the process, she reflects on the meaning of wild nature and its relationship to human nature. Now available at fine bookstores everywhere, and at Seattle Audubon’s Nature Shop and website (link). King County stretches from the lowlands of Puget Sound to the heights of the Cascade Crest and includes a wide variety of habitats, everything from urban cityscapes to rugged mountains. Scattered throughout this most urban of all counties are unexpected pockets of the wild, where birds lead their secret lives, far away from the control of humans. If you’re quiet, though, and know where to look, you can peek into this world, maybe even enter it for a time and become one with nature. No one knows the wilds of King County better than Gene Hunn, birder extraordinaire, citizen-scientist, environmentalist, and explorer. 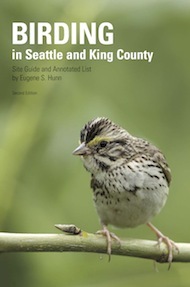 His newest book, Birding in Seattle and King County, takes birders and budding naturalists to all the county’s hotspots. With GIS-inspired maps, stunning color photographs, frequency graphs, and lists of all the rarities ever found since the 1860s, Hunn opens the doors of this magical world to anyone with an interest in nature and a pair of binoculars. 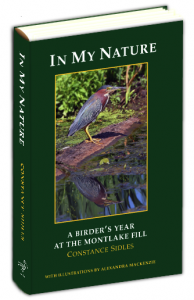 Published by Seattle Audubon Society October 2012; edited and produced by Constancy Press. In 32 essays covering the four seasons of the year, master birder Constance Sidles explores the wonders of the wild at the Montlake Fill, a nature reserve in the heart of northeast Seattle. The birds she finds here teach her to forget time. To leave worries behind. To experience joy. To find a refuge that gives peace of mind and a respite from the stresses of a fast-paced world.